The Salvation Army plans to put Square to use at 10 locations each in Dallas, San Francisco, Chicago and New York. 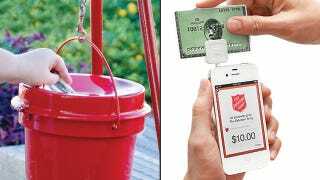 Bell ringers will carry Android smartphones donated by Sprint Nextel that are equipped with Square's postage-stamp-size card reader and two apps, one from Square and one from the Salvation Army. Donors swipe a card, just as they would at any credit card processing terminal, and the money goes into the Salvation Army's account. Other nonprofit groups and individual fund-raisers have used it too. A Girl Scout troop in Silicon Valley, for instance, used it earlier this year to sell some 400 boxes of cookies at Facebook's headquarters after the father of one troop member who worked there realized that many of his colleagues did not carry cash. One slight disadvantage to the credit card system is time. It takes only a few seconds to dig around in your pocket and throw into a bucket, and it takes at least a minute or two more to take out your credit card and swipe it. But who knows — 'tis the season to be charitable, after all.